In partnership with UNFCCC and UNEP who already took the “Train to Copenhagen” in the frame of the COP15 in 2009. In the frame of the Campaign "Train to Paris", UIC signed two Memorandum of Understanding with UNFCCC and UNEP. 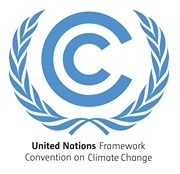 The United Nations Framework Convention on Climate Change, with Secretariat in Bonn, Germany is an international treaty agreed on during the United Nations Conference on Environment and Development (UNCED) in Rio de Janeiro in June 1992. The head of the secretariat has been Christiana Figueres, from Costa Rica, since 2010. The purpose of the Convention is to “stabilise greenhouse gas concentrations in the atmosphere at a level that will prevent dangerous human interference with the climate system." And that "such a level should be achieved within a time-frame sufficient to allow ecosystems to adapt naturally to climate change, to ensure that food production is not threatened, and to enable economic development to proceed in a sustainable manner." UNFCCC Convention was signed by 194 countries, proving the universal consensus that actions are required to fight climate change. UNEP partnership with UIC has always been strong and during COP15, Achim Steiner even took the “Train to Copenhagen”. The United Nations Environment Programme, with headquarters in Nairobi, Kenya, is an international agency created in June 1972, aiming to carry out environmental best practices in the following fields: atmosphere, ecosystems both marine and on Earth, governance and green economy. The present Executive Director of UNEP is Achim Steiner. The United Nations Environment Programme (UNEP) is the voice for the environment in the United Nations system. It is an advocate, educator, catalyst and facilitator, promoting the wise use of the planet’s natural assets for sustainable development. The mission of UNEP is to provide leadership and encourage partnership in caring for the environment by inspiring, informing and enabling nations and peoples to improve their quality of life without compromising that of future generations. UNEP strongly supports sustainable transport initiatives that contribute to a cleaner, greener future. The RATP is associated with the ‘Train to Paris’ event, since it is the natural link between the conventional rail system and the city. We are proud, therefore, to have been in a position to transport large numbers of guests between mainline stations in Paris and the UIC headquarters using ‘clean’ modes of transport, including our electrically-powered and hybrid buses. These are testament to the ambitious plan of the RATP to operate a 100% ecological fleet of buses by 2025. Since 2014, the RATP has been committed to major technological and ecological evolution, with the ultimate objective of converting most of its fleet of 4,500 buses to electric power by 2025: this is the Bus2025 Plan. This ambitious project reflects the desire of the Syndicat des Transports d’Île-de-France (STIF) to remove diesel-powered buses from the Île-de-France region. The Bus2025 Plan is aimed at creating a fleet of buses with 80% of them being electrically powered and 20% of them being powered by biogas. This arrangement will enable the RATP to eliminate 80% of greenhouse gas emissions from the bus network and 50% of its carbon footprint, thus becoming the world leader in ‘clean’ buses. Electrical energy is also the power source for our Metro and RER trains and for many years the RATP has been making strenuous efforts to modernise its fleet. Progressive renewal of rolling stock is a fundamental factor in our policy of reducing electrical power consumption, since the energy performance of these vehicles is far in advance of earlier generation equipment. A few facts about electrically-operated braking: in 2015, 77% of lines are using regenerative braking and 81% of trains are fitted with regenerative braking systems, the ultimate objective being to ensure that 100% of the Metro fleet is equipped with regenerative braking. To go further, the RATP is employing eco-driving on its automated Metro lines: on Line 14, modification of the automatic train operating system and integration into the control software of energy conservation objectives has yielded a reduction of 16% per year of the electrical energy consumed by the 25 trains in the fleet. In addition to vehicles, the RATP is aiming to be an exemplary company in the sustainable city concept. In fact, the RATP is pursuing a voluntary and innovative environmental policy in order to improve its environmental performance. As part of this policy, transport areas will all be equipped with LED lighting by 2016, which will cut electrical energy consumption by 50%. Technical, industrial and service industry buildings are also subject to a policy of energy efficiency and waste management.